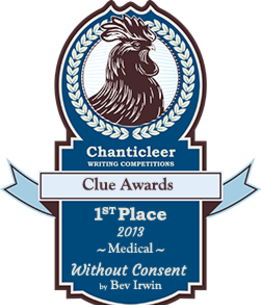 WITHOUT CONSENT is an edgy medical mystery set in south-western Ontario where a killer is at work. He is crafty, vicious, revealing medical technique as he excises the kidneys of women he abducts. Doctor Claire Valincourt, recently jilted, finds his first victim and assists with the autopsy. Relationship jaded Detective Rosko desperately searches for a killer who is on his own search. The hunt for a perfect kidney for the terminally ill mother he tends. The woman’s inert body jerked violently with the first slice, her face twisting into a grotesque mask of pain. He pressed on the stainless steel instrument and slid it across the taunt skin. She twitched several times, settled, then became still. The drug was working. He inspected her naked form–so beautiful, so perfect, so calm. He studied the soft swell of her breasts. He saw no movement, but the flicker of the feather he’d taped to her mouth told him she was still breathing. He glanced at the empty syringe. Maybe next time I’ll use less. Choosing a large towel, he draped it around the wound. Like long spider legs, blood scrambled along the towel tracing an intricate pattern on the white material. His hands trembled. Each beat of his accelerated heart rate hammered through his head. He needed to hurry, he needed to finish before the blood stopped circulating, he needed to do this right. Sliding his hands into the incision, he felt a thrill as the heat from her body penetrated his gloves. How long would she stay warm once she’d taken her last breath? A pool of blood filled the wound, obstructing his view. Damn. He needed to see. He pulled his hand out of the incision and used a dry corner of the towel to wipe away the fluid. The sight of so much blood sent a frigid wave sluicing down his vertebrae. He shuddered and reached for another towel. Within seconds it consumed the liquid gushing into the naked woman’s abdomen. He pitched the saturated towel over the table, grinning as it thudded on the cement floor. Dark fluid splattered in irregular shapes. He glanced at the family-sized ice filled cooler sitting a foot away. Droplets of blood showered the outer plastic and formed unique ink splat patterns. What would a psychologist make of them? His harsh laugh echoed through the room. The ice inside the cooler glittered like a mountain of diamonds– pure and unspoiled. Expensive, but worth it, the cooler would preserve his treasure for hours. He could use it for beer later. But he couldn’t think of that now. It was late, he needed to extract the organ and get it on ice before it spoiled. Then he could reward himself. He swabbed the incision. So much blood. And the smell. He closed his eyes and inhaled letting the unique metallic odor fill him. His heart was racing so fast he could feel it pounding against his ribs. Suddenly lightheaded, he leaned into the table until the dizziness passed. Willing his fingers to stop trembling, he forced himself to concentrate. He mopped at the pooling blood then inserted his gloved hand into the incision and probed her abdomen. There it is. His fingers closed around the organ, so soft and slippery and warm. He lifted his hand. Resistance. Pausing, he let his fingers travel the edges of the kidney. Gentle. You don’t want to damage it. He palpated the thin cord of vessel restraining the organ and encircled it with his index finger. Careful. Don’t be rough. You might bruise it. You know how important a good kidney is. You know what happens to the damaged ones. They can kill people, can’t they? Sweat trickled into his eyes and clouded his vision. Using the back of his hand, he wiped away the beads of perspiration coating his forehead. A stainless steel table sheathed in a thin green towel stood beside the bed. On it, aligned in a neat row, lay several shining silver instruments. With one hand cradling his prize, he reached over and selected a fine–toothed clamp. He slid it into the incision and guided it around the organ. Snapping the tiny teeth over the vessel, he occluded the flow of blood. He left the clamp in place and reached for the scalpel. Lifting the kidney a fraction of an inch at a time, he paused only when he felt tension on the vessel. He scrutinized the razor-sharp scalpel blade–a finely honed weapon. He had to be careful. It wouldn’t do to slip and leave a trace of his own blood. Inserting the scalpel into the gaping wound, he guided it beneath his hand. He felt the blade meet an impasse. With a swift slash he sliced through the tenuous strand. Blood spurted into the incision. Inhaling the scent, his heart skipped several beats and he became aware of the blood spurting through his own veins. That was the artery, now for the vein. He probed for the next vessel, clamping and cutting in a similar fashion. The cavity brimmed with blood and he couldn’t see. But now, it didn’t matter. He had what he wanted. He lifted his hand. He felt resistance. A thin tenuous cord stretched out of the wound. Another vein. Grasping the scalpel, he carved through the connective tissue and the organ came free. For several seconds he nestled the coveted organ as if holding a newborn robin in the palm of his hand. Its warmth seeped through his latex gloves. Below his hand, blood surged into the gaping wound. He shot a glance at the woman’s face. Mary Jane, her driver’s license said. How plain. He’d call her Gabrielle. Yes, she was more beautiful than a Mary Jane. He smiled at the woman lying unconscious on the stainless steel table–her ashen cheeks exhausted of their normal rosy coloring, her lips and eyelids tinted a powder blue not derived by artificial means. Dark shadows ebbed into the fragile skin below her staring eyes. An irregular grunt of air erupted from between her lips. He had to hurry. Should I take the time to stitch her up? Yes, finish the job properly. Laying the organ on the bed of ice, he turned back to the woman. He ripped open a package of fine black sutures and deposited it on the sterile green towel. Attaching the suture to the needle driver, he threaded it through the mottled skin. He worked quickly. Gabrielle wouldn’t care what her scar looked like. “I found the story to be a fascinating, page-turning, thriller, which kept me reading long after I should have gone to bed." Bev Irwin’s Without Consent is a Page-Turner. Richard Young Editor of The Beat Magazine. Perhaps you have heard the “urban legend” about Kidney Thieves, the one in which unsuspecting tourists have one of their kidneys surgically removed by strangers in unfamiliar hotel rooms in major North American and European cities. The harvested kidneys are then sold on the black market to the highest bidder. London author Bev Irwin borrows from the Kidney Thieves story, turning it on its head in her impressive medical crime novel, Without Consent, in which a serial killer methodically abducts women, surgically removes one of their kidneys while they are alive and then dumps their dead bodies in city parks. Irwin wastes no time getting her story started, introducing her nameless killer in the book’s opening chapter and describing his criminal MO in stark, bloody language. After the first victim’s naked body is discovered by ER Doctor Claire Valincourt during her morning jog the following day, the book’s main characters are introduced and their paths gradually interject as the hunt for the killer unfolds in the fictional town of Strathburn. Irwin has created very believable complex characters. As the dedicated ER Doctor, Valincourt exhibits the resourcefulness, sensitivity and toughness required by the job. The book’s criminal investigator, Detective Gerry Rosko, displays the necessary street smarts, tenacity and wherewithal one would expect. Yet, despite his best efforts, Rosko finds himself one step behind the novel’s serial killer for much of the story. Complicating matters, and acting as a convenient plot device, is the romantic and professional relationship that develops between Rosko and Dr. Valincourt as they join forces to stop the killer. Minor characters like the wisecracking medical examiner Dr. “Mac” MacFarlane, pushy TV news reporter Sherry Simmons, CIS technician Chao Sugimoto, and other police and medical personnel and suspects come in and out the narrative as necessary. The author takes the reader further and further into the troubled mind of her serial killer with each kidney harvesting episode, gradually revealing his identity and the motive behind his grisly actions. After Dr. Valincourt is abducted and finds herself strapped to the Kidney Slasher’s killing table, the novel races towards its logical conclusion. Bev Irwin draws upon her years of experience as a registered nurse in various medical settings and capacities to give the novel its medical authenticity. One can almost “smell” and hear the sounds of the hospital wards in which a good deal of the action takes place. With a number of Adult, Young Adult and Children’s published titles to her credit, Irwin knows how to tell a good story. She also writes romance novels under the pen name of Kendra James. Irwin has another novel featuring Claire Valincourt and Gerry Rosko in the works. “It will delve into medical research and the lengths that someone would go to in their quest to save a loved one,” she says. Without Consent is definitely a suspenseful page-turner and comes highly recommended. Without Consent begins at a fast pace and keeps up the thrilling action throughout the book. Dr. Claire Valincourt finds the first victim of a ruthless and insane serial murderer who is trying to develop his surgical aptitude on helpless victims. Detective Gerry Rosko is a man with rough edges but a good heart who meets Dr. Valincourt when he questions her about the first victim. The two quench passionate desires as they uncover clues that may lead Rosko to the killer. Although initially engaged by the brutal murders of women in his jurisdiction, the case takes an ominous turn for Rosko when the victims are women he personally knows. He’s all the more determined to find the killer when Valincourt becomes a target. Irwin creates the right amount of entertaining suspense as the victim tally mounts and keeps the reader turning the pages until the last chapter’s brilliant finish. Carole Avila, Author Eve’s Amulet, Book 1.